Below are some of the most popular edible wild mushrooms found in North America. Chanterelles are the most famously consumed wild mushroom species. An edible mushroom is a safe-to-eat fruit and fleshy body of numerous macro-fungus species. These macro-fungi grow above ground or below the ground. Edibility of macro-fungi is defined by many criteria’s including desirable aroma and taste, and absence of poison. Edible mushrooms are known for their medicinal and nutritional values. People practicing folk medicine consume medicinal mushrooms while psychedelic mushrooms are for entheogenic or recreational purposes. Psychedelic mushrooms produce a robust psychological effect; therefore they are not used as food. Although there are thousands of different mushrooms, only 250 are poisonous. 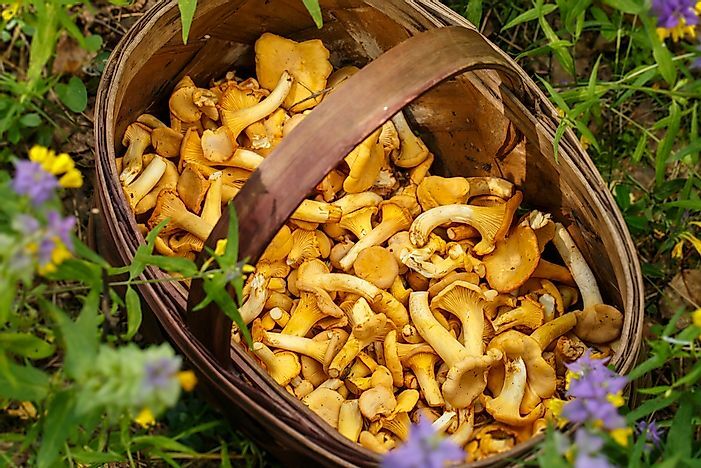 Therefore when foraging in the wild for mushrooms, one has to know which type of mushroom they want, since most edible mushrooms have toxic lookalikes. Besides, eating a poisonous mushroom can result in liver transplant or even death. Chanterelles are a prevalent name for macro-fungi in Cantharellus genus. These white, yellow, or orange funnel-shaped meaty mushrooms are the most famous consumed wild mushroom species. Some Cantharellus species release a fruity smell and they have a mildly peppery taste. Under the smooth cap, these mushrooms have gill-like ridges which run down to the stipe (stalk) that tapers down from the cap. Chanterelles grow in the northern region of Europe, in Africa in countries like Uganda, Congo, and Zambia, in Asia including the Himalayas and Turkey, and throughout North America. These mushrooms thrive in clusters in mossy-coniferous forests, but they can also grow in the Mountainous birch forest among the low-growing herbs and grasses. Golden chanterelles grow in beech forests, and in the United Kingdom, they can grow from July to December. Chanterelles can be mistaken for their lookalike false-chanterelles specifically the Hygrophorosis Aurantiaca. 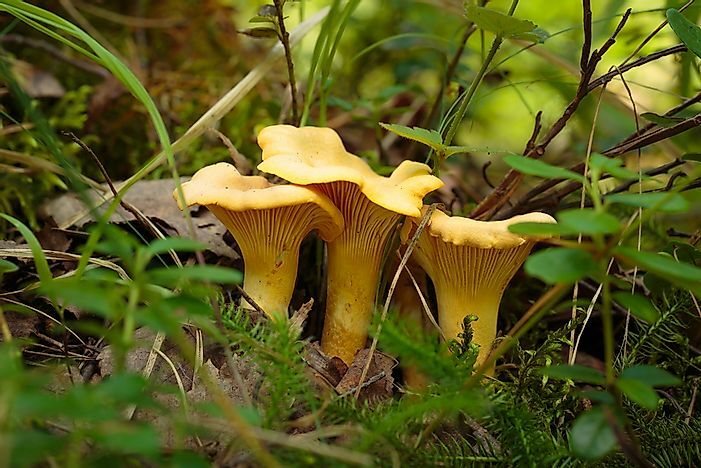 Their main distinguishing feature is their colors; a true chanterelle has a uniform egg-yellow color while a false one is orange with a dark center. True chanterelles have wrinkles or ridges on their stem which are not gills. Chanterelles can be mistaken for Omphalotus Olearius which is highly poisonous. Morchella, also called Morels, is a genus of edible mushrooms which are related to the Cup fungi. The Morchella has a unique honeycomb appearance caused by the ridges network with pits on the cap. Since cultivating it is impossible, commercial harvesting of the wild morels has grown into a multi-million dollar trade in the Northern hemisphere particularly China, Himalayas, Turkey, Pakistan, North America, and India. Just like most popular edible mushrooms, the Morchella has a dangerous false morel which is a lookalike. False morels is a word used to distinguish Morchella from the poisonous lookalike like Verpa bohemica and Gyromitra esculenta among other false morels. 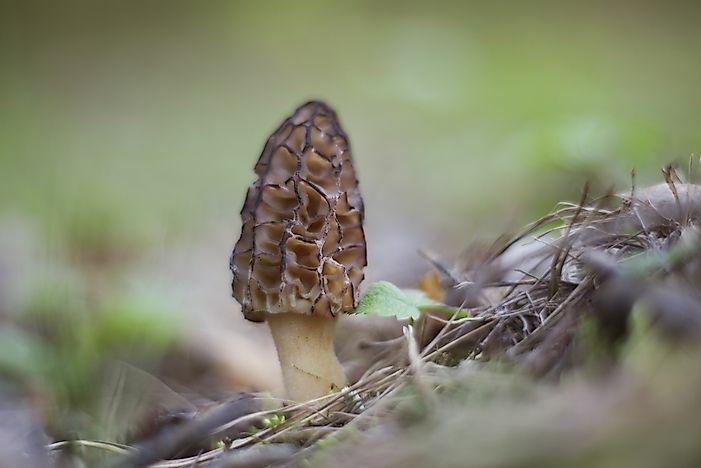 Although these morels are at times eaten without any ill effect, in most cases these mushrooms cause severe loss of muscular-coordination, severe gastrointestinal upset, and even death. Poisoning occurs when the mushrooms are eaten continuously for many days when inadequately cooked and in large quantities. False morels have an organic carcinogenic poison called gyromitrin which hydrolyzes when in the body to form monomethylhydrazine. In Poland Gyromitra esculenta is responsible for about 23% mushroom fatalities every year. Hericium Erinaceus also known as pompom, hedgehog, bearded-tooth, or Lion’s mane, is a medicinal, edible mushroom which grows on hardwood trees in fall and late summer, especially in American beech trees. Native to Asia, Europe, and America, the lion’s mane are identified by its long spine and its unique shape resembling a pompom or lion’s mane. The lion's mane can grow on high trees as high as 40 feet, and their spines grow from one group instead of the branch. Hericium Erinaceus has a unique taste which is often compared to seafood. 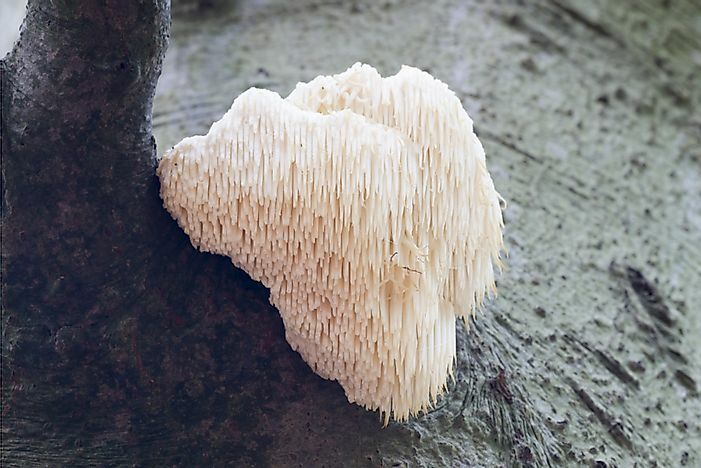 The lion’s mane is often mistaken for the other Hericium species growing in the same range, but they are all edible. Also referred to as sheep’s or ram’s head or hen-of-woods, Grifola frondosa grow well at the base of many hardwoods especially oaks. Maitake mushrooms start growing in the late summer time to early autumn in the Northeast, but it can also grow in Idaho. Since they can become huge with time, Maitake can be too tough for consumption, and therefore people are advised to harvest them while they are still young. 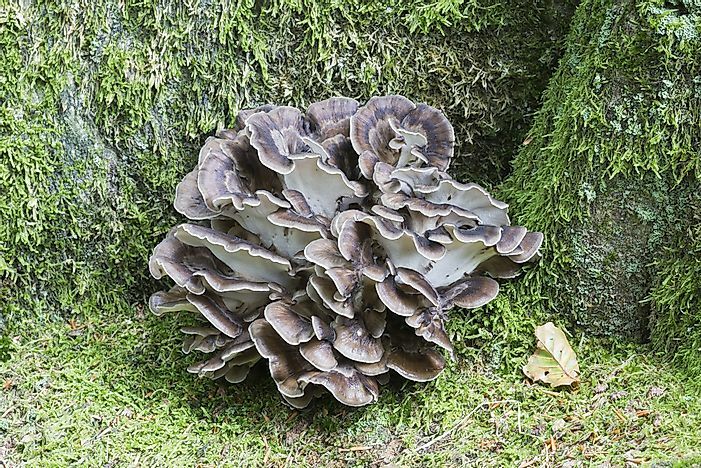 Older Maitake mushrooms should be dried, powdered and then added in sauces or soups. Maitake is native to northeast Japan, China, and North America, and the Chinese praise Maitake mushrooms for their medicinal value. Just like the Sulphur-shelf mushroom, Maitake is a perennial species which grows in the same position for many years. Maitake sprouts from an underground tuber-like structure referred to as sclerotium. The fruiting body usually about 39.4 inches is made up of a cluster of many grayish-brown curled caps with wavy margins. The caps are between 0.79 to 2.76 inches broad. The milky-white stalk of the mushroom has a branchy structure which toughens as it matures. In Japan, Grifola frondosa can grow to over 100 lbs in weight. Pleurotus ostreatus belongs to a genus of very common edible macro-fungi. Although they are prolific in a colder climate, the Oyster mushroom grows throughout the year. 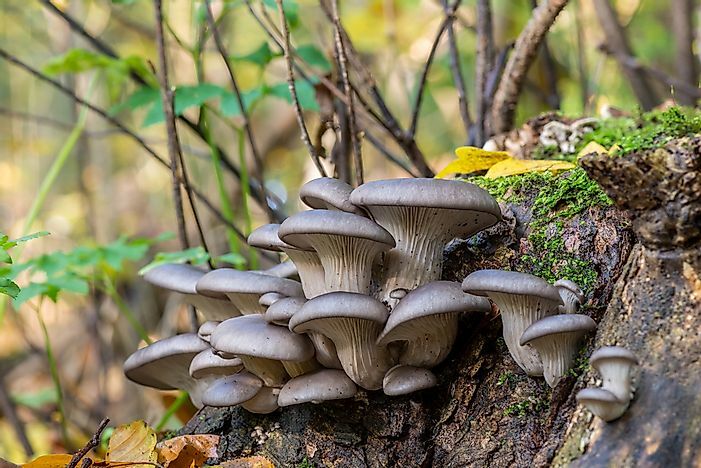 Oyster mushrooms are widespread in different subtropical and temperate forests in the world, but in the Pacific Northeast, Pleurotus populinus and Pleurotus Pulmonarius replaced Pleurotus ostreatus. Oyster mushrooms are saprotrophs which act as the primary decomposers of wood, especially beech tree and the deciduous trees. Oyster mushroom is a carnivorous species, and their mycelium kills and digests nematodes for nitrogen. Although this Pleurotus ostreatus can grow on dead hardwood trees, it is only acting saprophytic and not parasitically. Oyster mushrooms have a large oyster-shaped cap which can grow up to 9.84 inches in size. The color of the caps ranges from tan or grey to dark-brown, and when young the margin of these mushrooms are in-rolled smooth and somewhat wavy or lobed. The flesh is firm and white with varying thickness due to its stalk arrangement. The Pleurotus ostreatus has white to cream gills which descends to the stalk. These mushrooms grow on dead trees like dogwoods, maples, and oaks especially after the fisrt rain in the fall.